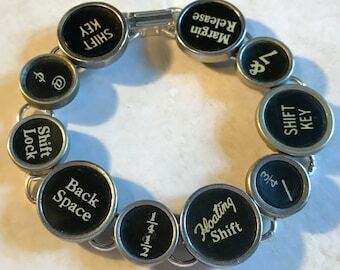 Vintage Watch Case Bracelet. Authentic, One-of-a-Kind. Fabulous! Just fabulous! Goes great with all my other bracelets! I couldn’t be happier! Great communication, fast custom order, great quality. Simply the best! Isn’t it WACKY how something so small can make me so happy! Received two watches instead of one. I really liked the second free watch greatly! Thanks for trying to accomodate my finger size. It's pretty simple. I do what I love and I do it all the time. After loosing my mom, dad and daughter, I started making jewelry and painting all the time.I never wished or intended to go back to the work force. I work out of my house where I can be close to everything I love, my family, and yes that includes all my animals, flowers, music and books. The joy in creating smiles on peoples’ faces as my jewelry brings back fun memories of growing up, or of family heirlooms they have forgotten. By combining authentic vintage watch parts, typewriter parts, buttons, tokens, and other objects from past ages with different metals, filigrees, and patinas. I enjoy provoking emotional remembrance. My work is currently for sale in several boutiques and Art Gallery’s around the country. I was recently honored to be featured in an article for the Journal & Courier’s Sunday paper titled “A Special Type of Design.” Another exhibit I was proud to be invited to was “GO FIGURE: Creatively Transforming Our Environment” in the McDonald Gallery in the Art Museum of Greater Lafayette. It was chosen as one of the top five out of over forty artists, and my work was showcased concurrently with illustrations from the Saturday Evening Post. Hello! Thanks for stopping by. I enjoy finding tattered objects that are no longer being used—things that can be given a new life with a new function but still maintain their integrity. You can find me featured in 'Jewelry Affaire' Magazine. Welcome to my store. If you have any questions, please contact me and I will be happy to get right back to you. I enjoy finding tattered objects that are no longer being used—things that can be given a new life with a new function but still maintain their integrity and the feel of a long-ago era from which they came. I take joy in creating smiles on peoples’ faces as my jewelry brings back fun memories of growing up, or of family heirlooms they have forgotten. By combining authentic vintage watch parts, typewriter parts, buttons, tokens, and other objects from past ages with different metals, filigrees, and patinas, my pieces are truly one-of-a-kind and are meant to provoke emotion and remembrances. Being an artist who creates each one-of-a-kind piece, it is very important to me that you love what chose. If for some reason you would like to return your purchase, please contact me within 48 hours after you received it. If it is returned immediately after contacting me in the same condition as when it was shipped, I will be happy to refund your money. Please don't hesitate to contact me with any questions or concerns anytime. I'm easy to deal with and at the end of the day I want people to love what they get and be happy with their purchase. I accept all major credit and debit cards as well as PayPay and echeck. Payment is due within 24 hours. If you need longer, please let me know. * Payment made by echeck will not be shipped until echeck has cleared. Be aware that this could take up to 10 business days. * Sorry, but I only ship within the United States. 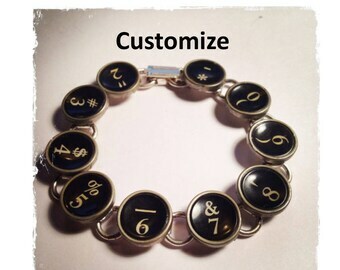 * Custom orders are ALWAYS welcome. Reserve listings will be held for 4 days. * All items are shipped within 3-5 business days unless otherwise noted. If it will take longer, I will notify you immediately. Please allow for additional time during the Holidays. Unless I message you, you WILL receive your order before Christmas. If you don't need it by then, please let me know. Wholesale and consignment available. Please message me for more information.